After many (too much?) research hours, i have collected information about the text that is objective hard data. Since i do not know where to put it, i created this page which will contain this raw data. “paragraph textpages” (=”text paragraphs pages”) and “label pages” definition, see here. There you can also find downloadable Excel sheets. If you want to know more about the letter positions. Have a look here. In the CAB total text, 20314 times a gallow can be counted. If we look at the “paragraph textpages”, there are 3905 paragraphs in 203 pages. 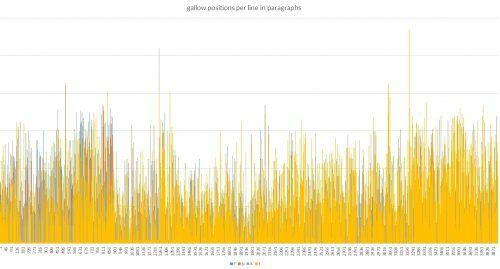 If we look at the first words of those paragraphs, the first words of lines in other words, there are 890 cases where the first letter is a gallow character and in 479 cases the second letter. 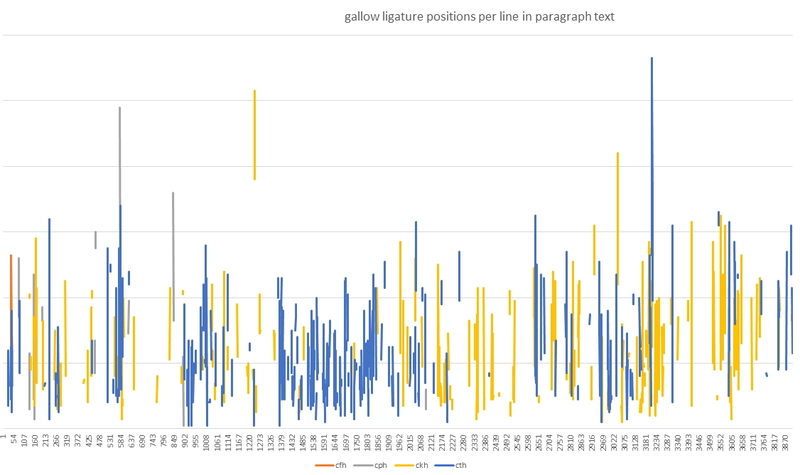 This adds up to 1369 which is 35% of all paragraphs that have a gallow in the first word. 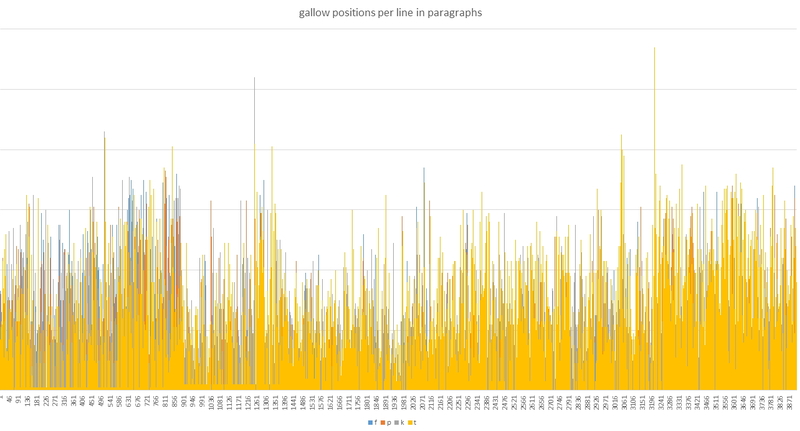 Again, observe that 1369 times a gallow only reflects the first 2 letters of a first word of a paragraph. If we only look at the first words, of every paragraph textpage, there are 193 out of 203 pages that have a gallow on the first or second character. That is 95%. ckh (779 times), cph (185 times), cth (805 times), cfh (63 times). Compared to the 20314 gallow count, 1832 is only 9%. * : a word is also considered to be a ‘vord’ in this search which means that if a part of a word is found, that is counted as 1 hit. F.e. if we search for ‘kain’, and we find okain and qokain, we counted 2 occurences for kain. 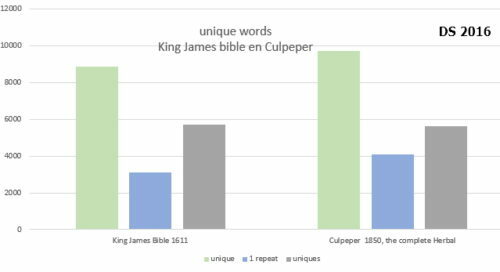 Thus, 1110 label words do occur in the (other) text pages, that is 45% of all words in the label pages and 16% of the words in the text pages could refer to the label pages. That seems fair. On the other there are 1382 words in the label pages, that do no occur in the entire manuscript anywhere else than on the label pages. That is strange, unless those words are so unique that they represent a unique number, such as for a catalogue or a reference nr. It is also possible that those words are real unique names or thirdly these words are in essence the same as other words (stem) but they have been conjugated or changed in the context or perhaps more specified. For example: carr_ in the text and in the label pages carrota. the most repeated word would be repeated 15 times in the entire list of found words. the most repeated word would be repeated 12 times only inside. 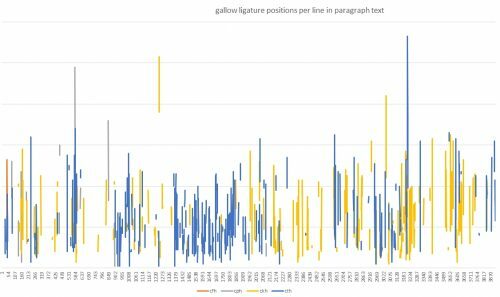 Unique words for the Entire text and per section were analyzed (words unique). Then the column “of which with 1 repeat” show the counted words that are unique, but only occur once. All the other words are the “repeated uniques” and they have a specific higher count. the words that are repeated more than once are higher in that section only. In all other sections the words that have only 1 repeat are higher. Single letter words are stand-alone letters. It does not say for example ‘daiin’ but only ‘y’.